Kodiak (Alutiiq: Sun'aq; Russian: Кадьяк, tr. Kadʹyak) is one of seven communities and the main city on Kodiak Island, Kodiak Island Borough, in the U.S. state of Alaska. All commercial transportation between the entire island and the outside world goes through this city either via ferryboat or airline. The population was 6,130 as of the 2010 census. 2014 estimates put the population at 6,304. View of Kodiak from Pillar Mountain. At center, from top to bottom: the Near Island Bridge, downtown and the small boat harbor. Originally inhabited by Alutiiq natives for over 7,000 years, the city was settled in the 18th century by the subjects of the Russian crown and became the capital of Russian Alaska. Harvesting of the area's sea otter pelts led to the near extinction of the animal in the following century and led to wars with and enslavement of the natives for over 150 years. After the Alaska Purchase by the United States in 1867, Kodiak became a commercial fishing center which continues to be the mainstay of its economy. A lesser economic influence includes tourism, mainly by those seeking outdoor adventure trips. Salmon, halibut, the unique Kodiak bear, elk, Sitka deer (black tail), and mountain goats attract hunting tourists as well as fishermen to the Kodiak Archipelago. The Alaska Department of Fish and Game maintains an office in the city and a website to help hunters and fishermen obtain the proper permits and learn about the laws specific to the Kodiak area. The city has four public elementary schools, a middle and high school, as well as a branch of the University of Alaska. An antenna farm at the summit of Pillar Mountain above the city historically provided communication with the outside world before fiber optic cable was run. Transportation to and from the island is provided by ferry service on the Alaska Marine Highway as well as local commercial airlines. The Kodiak Archipelago has been home to the Alutiiq for over 7,000 years. In their language, qikertaq means "island". In 1763, the Russian explorer Stephan Glotov discovered the island, calling it Kad’yak (Кадьяк). He was followed by the British captain James Cook fifteen years later, who first recorded "Kodiak" in his journals in 1778. In 1792, the Russian Shelikhov-Golikov Company chief manager Alexander Baranov moved the post at Three Saints Bay (established in 1784) to a new site in Paul's Harbor (Свято-Павловской гавани, Svyato-Pavlovskoy Gavani). This developed as the nucleus of modern Kodiak. :7 Baranov considered Three Saints Bay a poor location because it was too indefensible. The relocated settlement was first named Pavlovskaya Gavan (Павловская гавань – Paul's Harbor). A warehouse was built in what became one of the key posts of the Shelikhov-Golikov Company, a precursor of the Russian-American Company and a center for harvesting the area's vast population of sea otters for their prized pelts. The warehouse still stands as the Baranov Museum. Because the First Native cultures revered this animal and would never harm it, the Russians had wars with and enslaved the Aleuts during this era. Eastern Orthodox missionaries settled on the island by the end of the 18th century, continuing European settlement of the island. They held the liturgy in native Tlingit from 1800. The capital of Russian America was moved to Novoarkhangelsk (modern-day Sitka) in 1804. The Russian-American Company was established in 1799 as a joint-stock company by decree of Emperor Paul to continue the harvest of sea otter and other fur-bearing animals and establish permanent settlements. By the mid-19th century, the sea otter was almost extinct and 85% of the First Native population had disappeared from exposure to European diseases and violence. When Russia sold Alaska to the United States in 1867, Kodiak developed as a center for commercial fishing, and canneries dotted the island in the early 20th century until global farm-raised salmon eliminated these businesses. New processing centers emerged and the industry continues to evolve. During the presidency of Theodore Roosevelt, animals such as the mountain goat, Sitka deer (black tail), rabbits, muskrats, beavers, squirrels, and others were introduced to the island and the Kodiak National Wildlife Refuge was created. 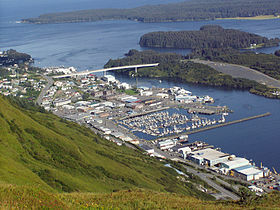 As Kodiak was incorporated in 1941, the U.S. feared attack from Japanese during World War II, and turned the town into a fortress. Roads, the airport, Fort Abercrombie, and gun fortifications improved the island's infrastructure. When Alaska became a state in 1959, government assistance in housing, transportation, and education added additional benefits. In March 1964, a tectonic tsunami struck the city during the 1964 Alaska earthquake with 30-foot (9.1 m) waves that killed 15 people and caused $11 million in damage. Some areas near Kodiak were permanently raised by 30 feet (9.1 m). It wiped out the neighboring Native villages of Old Harbor and Kaguyak. The Standard Oil Company, the Alaskan King Crab Company, and much of the fishing fleet were also destroyed. Kodiak is located on the eastern shore of Kodiak Island. According to the United States Census Bureau, the city has a total area of 4.9 square miles (12.6 km2), divided into 3.5 sq mi (9.0 km2) of land and 1.4 sq mi (3.6 km2) (28.66%) of water. Kodiak has a subarctic climate (Köppen Dfc) that very closely borders a humid continental climate (Dfb) marked by chilly to cold weather year-round. Precipitation is heavy year-round, though markedly less in the summer months. Kodiak first appeared on the 1880 U.S. Census as the village of Saint Paul (not to be confused with the city of St. Paul located in the Aleutian Islands). It reported a population of 288, of which 253 were "Creole" (a mixture of Russian and Native Alaskans), 20 Whites and 15 Aleuts. In 1890, it would report as "Kadiak" (the then-spelling). In 1900, it returned as "Kadiak Settlement." From 1910 onwards, it reported as Kodiak, and would formally incorporate in 1940. As of the census of 2000, there are 6,334 people, 1,996 households, and 1,361 families residing in the city. The population density is 706.8/km2 (1,832.7/mi2). There are 2,255 housing units at an average density of 251.6 persons/km2 (652.5 persons/mi2). The racial makeup of the city is 46.40% White, 0.69% African American, 10.47% Native American, 31.73% Asian, 0.93% Pacific Islander, 4.36% from other races, and 5.42% from two or more races. 8.54% of the population are Hispanic or Latino of any race. There are 1,996 households out of which 40.2% have children under the age of 18 living with them, 52.1% are married couples living together, 10.3% have a woman whose husband does not live with her, and 31.8% are non-families. 24.2% of all households are made up of individuals and 5.4% have someone living alone who is 65 years of age or older. The average household size is 3.10 and the average family size is 3.64. In the city, the population is spread out with 29.1% under the age of 18, 8.7% from 18 to 24, 32.2% from 25 to 44, 23.1% from 45 to 64, and 6.8% who are 65 years of age or older. The median age is 34 years. For every 100 females, there are 114.3 males. For every 100 females age 18 and over, there are 120.6 males. The median income for a household in the city is $55,142, and the median income for a family is $60,484. Males have a median income of $37,074 versus $30,049 for females. The per capita income for the city is $21,522. 7.4% of the population and 3.7% of families are below the poverty line. Out of the total people living in poverty, 8.4% are under the age of 18 and 0.0% are 65 or older. Among the companies based in Kodiak is Koniag, Incorporated. Kodiak is an important environmental asset which affects the fishing industry, particularly salmon fishing. Its wild game is coveted by hunters worldwide for the Kodiak bear and other game animals; there are strict laws governing fishing and hunting activities as well as hiking near spawning streams. Both the Department and the city maintain websites and publish brochures to help communicate these strictly enforced laws. All of the city's hotels and businesses have these materials in prominent areas for guests, and licenses can be purchased in the city's main sporting goods store and online. The United States Navy operates a small training base near the city called Naval Special Warfare Cold Weather Detachment Kodiak which trains United States Navy SEALs in cold weather survival and advanced tactics. The United States Coast Guard has a major presence in Kodiak, Alaska. The city of Kodiak is home to a number of annual events that draw locals and people from off-island. The most well-known of these is Kodiak Crab Festival. Organized by the Kodiak Chamber of Commerce, the event takes place over Memorial Day weekend. It includes a county fair-style main event, with carnival rides, food and game booths, and group activities. In addition, a number of events are organized over the three-day weekend that include a kayak race, a marathon, an ultra-marathon, a 9.2-mile (14.8 km) mountain run called the Pillar Mountain Run and others. The Kodiak Island Borough School District operates four elementary schools, one middle school and one high school (Kodiak High School) within city limits. The city is home to Kodiak College, a satellite campus of the University of Alaska Anchorage. Within the public school district, there are eight rural schools. Kodiak Bears sports have a long tradition dating back into the 1960s, when Joe Floyd was successful in coordinating high school athletics as well as intramural sports. He was a coach for several sports, as well as an athletic director for several years. Joe Floyd Track and Field Stadium in Kodiak is named after him. There have been a total of nine ASAA affiliated State Championships in the variety of 2 Boys Track, 1 Girls X-Country, 1 Girls Basketball, 1 Boys Basketball, 1 Boys Baseball, and most recently, a string of three consecutive titles in Boys Cross Country (2006–08). The boys cross country team was led by 3-time state individual champion Trevor Dunbar, who ran for the University of Oregon. Kristy Klinnert was the Alaska State Cross-Country Running Champion from 1983–1987. She set and still holds the State record in the 3200. For two years in a row, she won the State Championship in the mile and 3200. In 1986, Kristi was named the Alaska Sports Person of the Year. Kodiak is also home to Saint Herman's Orthodox Theological Seminary, a theological school founded in 1972 under the auspices of the Orthodox Church in America. Students from villages all over southern and southwestern Alaska study at St. Herman's in order to become readers or clergy in the Orthodox Church. The ferryboat MV Tustumena is part of the Alaska Marine Highway. She can carry 210 passengers and serves Kodiak, Homer, Whittier, and the Aleutian Islands as far west as Dutch Harbor. A floatplane dropping off guests at a remote wilderness lodge on Raspberry Island, part of the Kodiak Archipelago. All guests at these lodges begin their journey in the city of Kodiak. Kodiak Airport attracts both local and regional airlines, air taxis, and charter floatplanes and helicopters which provide transportation to residents and tourists traveling on and off the island. The Alaska Marine Highway provides further transportation via two ferries, MV Tustumena and MV Kennicott. 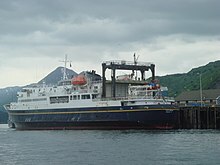 These ships can carry 211 and 748 passengers, respectively, and serve routes between Kodiak, Homer, and Whittier, although the ferry system no longer takes passengers to Seward. Floatplane and bush plane companies regularly take tourists to remote areas and wilderness lodges both on the various islands of the Kodiak Archipelago and the Katmai coast for bear viewing, hunting, and hikes. The city business community also has a fleet of privately owned taxis as well as kayaks, mountain bikes, and all-terrain vehicles (ATVs) for rent. Kodiak is primarily served by Providence Kodiak Island Medical Center, the only true hospital medical center on Kodiak Island. Individuals located in the smaller surrounding communities are often airlifted into the hospital via helicopter or air ambulance due to remoteness and nonexistent or poor road connections. The city of Kodiak and these smaller communities are also served by volunteer EMT workers and local clinics. Most electrical energy for the city is provided from the Terror Lake Hydroelectric Generating Station owned by the Kodiak Electrical Association. Substantial amounts of energy are also provided by wind turbines and by diesel generators. There are six wind turbines that supply up to 1.5 MW each and have a blade length of 38.5 meters and overall height of 118.5 meters. Kodiak and its USCG base have a center role in the movie The Guardian starring Kevin Costner and Ashton Kutcher, some scenes were shot there and in the USCG base. In 2012, rapper Pitbull was involved in an advertising campaign with Walmart, in which the Walmart store that gets the most Facebook "likes" from June 18 to July 15, 2012 would have Pitbull visit and put on a show there. An orchestrated internet campaign urged people to vote for the most remote location imaginable, Kodiak, resulting in a sizable lead for that store. Walmart confirmed that Kodiak won. Pitbull visited on July 30 where he received a key to the city from mayor Branson and then made an appearance before a crowd of hundreds at the Coast Guard base. The Weather Channel docu-series Coast Guard Alaska follows the lives of Coast Guard members stationed in Kodiak. Czech carmaker Škoda Auto named their new SUV the Škoda Kodiaq, after the Alaskan brown bear, and in tribute Kodiak was renamed Kodiaq for one day (May 6, 2016). In a spelling change also intended to honor the indigenous Alutiiq, the city was renamed with a number of signs changed across town, including the port facilities and city limits. The letter ‘Q’ is a common ending for nouns in the Alutiiq language. ^ 1996 Alaska Municipal Officials Directory. Juneau: Alaska Municipal League/Alaska Department of Community and Regional Affairs. January 1996. p. 84. ^ 2015 Alaska Municipal Officials Directory. Juneau: Alaska Municipal League. 2015. p. 90. ^ Haycox, Stephen W. (2002). Alaska: An American Colony. University of Washington Press. p. 82. ISBN 978-0-295-98249-6. ^ Rosenberg, Bernard (2006). Kodiak Fishing at any Angle. Bernard Rosenberg. pp. 32–40. ISBN 978-0-9777414-0-3. ^ "Average Weather for Kodiak, AK - Temperature and Precipitation". The Weather Channel. Archived from the original on 2011-06-04. Retrieved 2010-03-08. ^ "Climate Information for Kodiak - Alaska - Alaska - United States - Climate Zones". Retrieved 2010-05-11. ^ Moffatt, Riley. Population History of Western U.S. Cities & Towns, 1850–1990. Lanham: Scarecrow, 1996, 4. ^ "American Factfinder" (CSV). United States Census Bureau. 2009-03-18. Retrieved 2011-07-07. ^ Huisman, Jan (November 28, 2008). "Navy SEALs Find Ideal Training Grounds In Kodiak". Fairbanks Daily News-Miner. Retrieved 2008-11-30. [permanent dead link] United States Navy, Naval Special Warfare Public Affairs (March 21, 2007). "Cold Warfare: Future SEALs Get a Firsthand Lesson in Northern Exposure" (U.S. Navy press release). GlobalSecurity.org. Retrieved 2008-11-30. ^ O'Leary, Joseph (Jul 5, 2012). "Contest may send rapper Pitbull to Alaska Walmart". Reuters. Retrieved 7 July 2012. ^ "Walmart: Rap star Pitbull to appear in Kodiak". Anchorage Daily News. Jul 21, 2012. Archived from the original on 27 July 2012. Retrieved 22 July 2012. ^ "Pitbull performs in Kodiak". New York Daily News. Jul 31, 2012. Retrieved 4 August 2012. ^ "The Weather Channel Greenlights New Series "Coast Guard Alaska"". The Futon Critic. Retrieved March 18, 2015. ^ a b c "Alaskans Are So Happy About The Škoda Kodiaq That They Renamed Their City For It". JALOPNIK. Retrieved May 10, 2016. ^ "Let's All study Alutiiq!" (PDF). Alutiiq Museum. Retrieved May 10, 2016. Wikivoyage has a travel guide for Kodiak.